Here is a love spell perfect for Beltane – although you can do it at any time really. Is there someone who you used to be romantic with but have lost touch with over the years? Do you sometimes wonder what happened to them and would love to hear from them again? Well, the obvious thing is just to send them a message to say, “Hi, I haven’t seen you for ages, how are you doing?” But sometimes a little magic can help too. What you need for this spell to make a former lover remember you, is a picture of you and the other person together, some olive oil, a few drops of essential rosemary oil or dried rosemary, and an old candle – preferably one that you started burning when you were with your old flame, but which still has some life left in it. 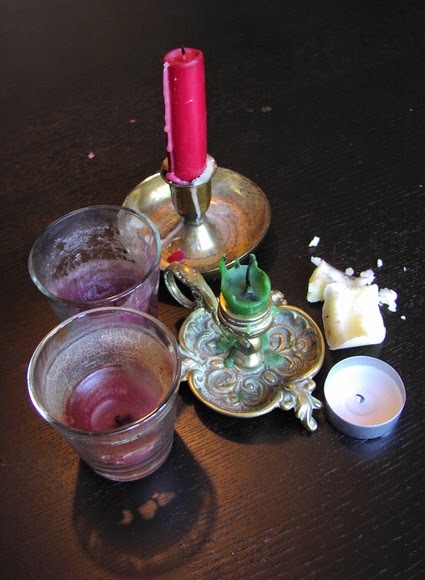 Now, most instructions for candle magic say that you should always use a brand new candle for spellwork, but this spell is a bit different, as you can see. The symbolism of this being an old candle is one of the things that makes it work. It is even better if it was a candle that partly burned when the two of you had a romantic time together, but don’t worry too much if it doesn’t have that connection. What you need to do is carve both of your names into the candle stub, put it in a holder and then anoint it with the olive oil into which a few drops of rosemary oil or a pinch of dried rosemary have been added. Rosemary is magically associated with love and in aromatherapy helps boost memory. Then ideally let the candle burn down completely. If you don’t have time to do that, snuff the candle out and relight it another time. You can find out more about candle spells in my book Pagan Portals - Candle Magic. Good luck! Hope it works!